Back from BrickFest 2004 and my head is still spinning. I'll post details when I get a chance. 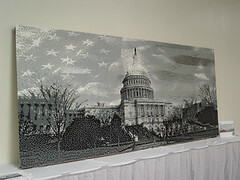 In the mean time, enjoy this pict of the Capitol Building made from several mosaic sets... and a link to the pictures I took on Flickr .